The Blanchard Machine Company, a manufacturer of machine tools, was established in Boston in 1899. After a fire just five years later, the company relocated to Cambridge and constructed a 13,000 square foot factory on State Street. 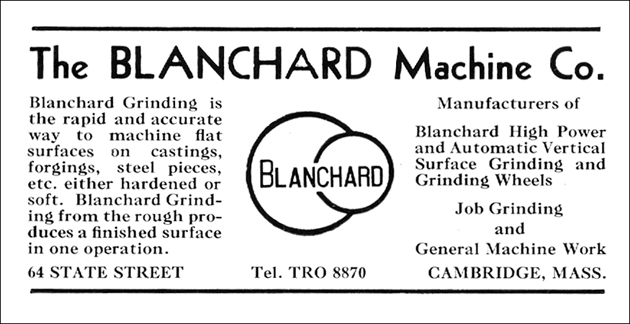 By 1909, the company began manufacturing the Blanchard surface grinder, which quickly became its primary product. The grinders, which were used to create flat surfaces on tools and parts, were relied upon heavily in metal work in the United States and abroad. By 1930, the company factory occupied over 50,000 square feet and provided employment for over 150 mechanics (Stone, 1930).